NEW YORK CITY — A dozen Latin American youth gathered under the statue of George Washington in Union Square on Friday afternoon to publicly declare their status as undocumented immigrants. The rally, organized by the New York State Youth Leadership Council, was part of a ‘National Coming Out Campaign.’ “Coming out” is a term commonly used by LGBT individuals who announce their sexual orientation openly for the first time. In this context, the young immigrants said that “coming out” meant they were no longer afraid of letting the world know their immigration status. In front of a crowd of approximately 30 onlookers and press, the students declared themselves to be Americans. In many cases they hadn’t known their immigration status for years–because their families hid it from them. They called on President Obama and Congress to take immediate action to pass the Dream Act, a bill that would give undocumented young people a chance to apply for citizenship if they pursue higher education or join the military. 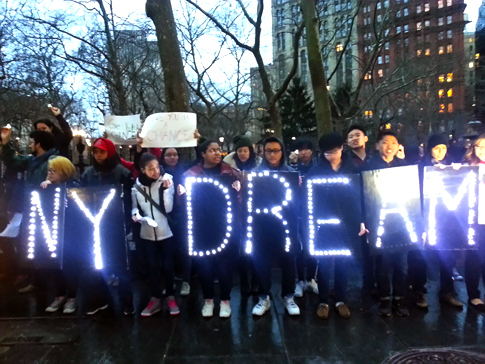 The Dream Act passed the House last fall but failed to advance to a vote in the Senate. In their campaign the youth have been using social media and public rallies to “come out of the shadows.” The effort is meant to shed light on the plight of undocumented immigrants and take away the stigma associated with being paperless. 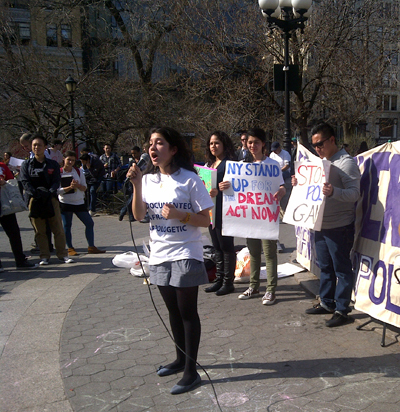 Melissa Gutierrez Valez, a twenty-year old Colombian American who wore a t-shirt with the slogan “Undocumented, Unafraid and Unapologetic, acknowledged that there’s a high level of fear when she and other students publicly expose their status. Gutierrez Valez said her goal is the passage of the Dream Act or some other form of immigration reform that would start the undocumented on a path towards citizenship. Yet politically, at this time, the chances of passing the Dream Act or any other kind of immigration reform appears untenable. Asked by Fi2W whether a form of the Dream Act could pass Congress in this session, Congressman Charlie Rangel (D-NY) gave a plaintive sigh. “I don’t know, the session just started. We already passed this in the House of Representatives, and we’re hopeful that something good can happen in the Senate. But Republicans and Democrats are polarized and commonsense and reason is not governing right now,” Rangel said. Addressing a rise in anti-immigrant sentiment also appeared to be a goal of the rally, with the organizers repeatedly telling the audience that they would no longer live in fear. The youth at the demonstration pointed to negative portrayals of undocumented immigrants and said that movements such as theirs sought to humanize the issue and stem the rise of anti-immigrant hate crimes across the country. “We’re more than a paper, we’re human beings,” Gutierrez Valez shouted to the crowd in a speech. 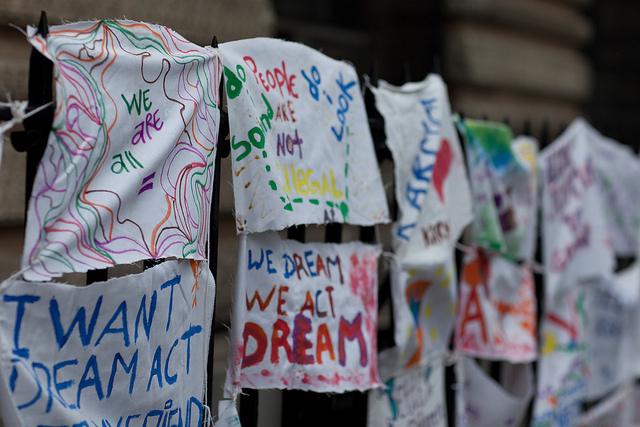 The students are planning more protests and activities over the next month and seek to make the term “undocumented” a trending topic in social and mainstream media. Aswini Anburajan’s reporting is supported by a media policy grant from The Media Consortium.